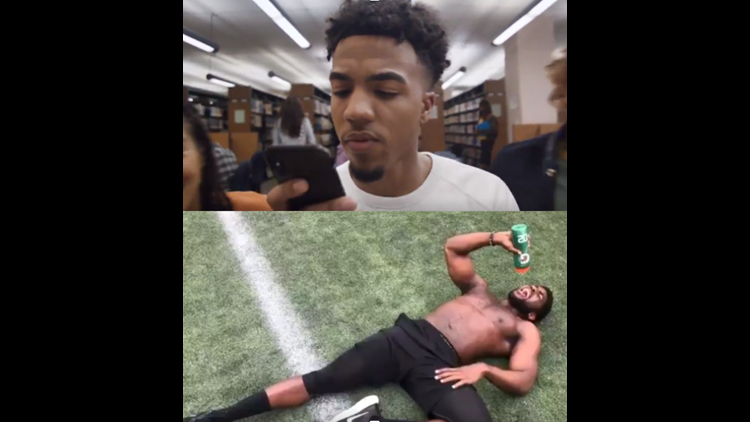 Top, Actor paid by NCAA for genuine Day-in-the-Life of a Student Athlete video; Bottom, actual former NCAA athlete and NFL linebacker parodies NCAA. They just had to show, first-hand, why they are America's most exploitable corporate colossus. WASHINGTON — All they had to do was take their annual billion from the networks, shut up, watch 32 games over the next two days and hope beyond hope no one noticed that their work force was yet again not getting a dime for the greatest and most profitable event on the nation's sporting calendar. But the ignorant, tin-eared souls who lord over the National Collegiate Athletic Association could not let it go. They had to show, first-hand, why they are America's most exploitable corporate colossus, doling out unpaid internships -- under the guise of athletic scholarships, some of which are not renewed and others of which are never genuinely used -- since 1906. The NCAA's Day-in-the-Life-of-a-Student Athlete video, released before the tournament, went beyond the hypocrisy of just using the muscle and sweat of human bodies -- mostly African-American bodies, who make up just 2.4 percent of undergraduates among the five power conferences but more than 56 percent of its men's basketball teams -- to fill their members schools' academic and athletic coffers. No, the 30-second spot was so brazen and blind to the reality of a system so broken (that now even the old guard is calling for some sort of athletic stipend for athletes who make significant money for their schools), that many of the NCAA's cheated and exploited alumni felt strongly about clapping back. And from Alex Caruso, the former Texas A&M player now with the Los Angeles Lakers ("Y'all paid the actors in this more than the real Student Athletes") to NFL veteran wide receiver and Maryland alum Torrey Smith ("Dear future STUDENT athletes this ain’t real. Get ready for a grind, early mornings, mandatory check ins, mood swings and terrible sleep"), clap back they did. In the hundreds. On Twitter. In parodies. Everywhere. Emmanuel Acho's parody has nearly 2 million views. The Philadelphia Eagles' linebacker received more than 80,000 retweets of his video, barely outdistancing the NCAA's actual video, which had, uh, 4,000 retweets. "The NCAA could act as The Masters and Augusta National Golf Club if it wished," wrote Jay Bilas, the ESPN college basketball analyst and long-time NCAA critic. "The Masters does not allow commercialization of its product beyond its comfort level and has rules for its media partners. Augusta National could make far more money off that property if it wished, but it finds other things more important. Not the NCAA. If your decisions reveal your priorities, the NCAA's first priority is money. " Student athletes themselves aren't the only ones angered by the video. Parents, the ones who may have the most accurate depiction of how athletic pursuits have affected their kids, have also taken to social media to shed light on the "accuracy" of the ad. Amazing, no, the one time all year this duplicitous, lost-in-time governing body, one that has really no governing principle other than to make money, money, money. Make money off of 18- to 22-year-olds -- who needed a labor union about 50 years ago -- and they even screw that up. Mark Emmert and his phony careerists and human neckties were their own Debbie Downer before the ball was tipped. Now, do us a favor for the next three weeks: shut up and watch the games.